Dr. Salanki is a rising entrepreneurial star in the international chiropractic field. Merging the hands-on and tradition based science of chiropractic with the innovation of cutting edge technologies has been his mission, both within his very busy practice as well as on his active international lecture circuit. 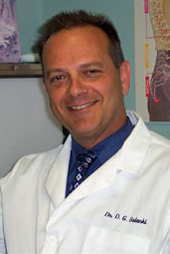 “Retaining the fundamental concepts and philosophies of chiropractic while embracing and driving innovation has been my focus throughout my professional life.” Dr. Salanki has assembled a diverse and talented team of enthusiastic and energetic health professional to build Chiropractic Associates of Port Colborne to its current level of excellence and one of the most modern practices in the province. Dr. Salanki is currently past President of The Canadian Contemporary Acupuncture Association and Clinical Instructor and Senior Lecturer with the Contemporary Medical Acupuncture Program at McMaster University, yet still finds the time to run an extremely successful practice, several businesses and devote time to his two daughters. Leading the charge of Medical Acupuncture passing legislature, he spent some time working and studying in China along with lecturing to Medical Doctors, Physical Therapists, Chiropractors and other health care providers on an international scale. At Chiropractic Associates of Port Colborne you will find an eclectic collection of services. Dr. Salanki uses technology in all aspects of his practice. From high-tech therapies to computerized patient education tools, the Sigma Instrument technology along with unparalled patient care brings patients to Chiropractic Associates of Port Colborne from Southern Ontario and Western New York.